Crystal clear graphs, slides, and reports are valuable – they save an audience’s mental energies, keep a reader engaged, and make you look smart. This webinar held on June 6, 2017, covers the science behind presenting data effectively and will leave viewers with direct, pointed changes that can be immediately administered to significantly increase impact. Guest Stephanie Evergreen also addresses principles of data visualization, report, and slideshow design that support legibility, comprehension, and stick our information in our audience’s brains. Evergreen’s presentation was followed by an audience question-and-answer session, which is included in the recording. Not all the questions were answered at the time, and Evergreen answers some additional session questions below. Evergreen is an internationally recognized speaker, designer, and researcher best known for bringing a research-based approach to better communicate through more effective graphs, slides, and reports. She holds a PhD from Western Michigan University in interdisciplinary evaluation, which included a dissertation on the extent of graphic design use in written research reporting. Evergreen has trained researchers worldwide through keynote presentations and workshops, for clients including Time, Verizon, Head Start, American Institutes for Research, Rockefeller Foundation, Brookings Institute, and the United Nations. She is the 2015 recipient of the American Evaluation Association’s Guttentag award, given for notable accomplishments early in a career. She is co-editor and co-author of two issues of New Directions for Evaluation on data visualization. She writes a popular blog on data presentation at StephanieEvergreen.com. Her books SAGE Publishing books Presenting Data Effectively and Effective Data Visualization both reached No. 1 on Amazon bestseller lists. 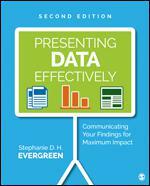 A second edition of Presenting Data Effectively was published in May. When is it best to place the data information (e.g. 20 percent) on a bar or lollipop vs. using a scale on the side or bottom of a chart? If people will want to know the exact value, add the data label. If the overall pattern of the data and estimated values are sufficient, use a scale. But don’t use both – that’s redundant. How do your clients and colleagues respond to the ‘flipped report,’ in which research findings and conclusions are presented before the discussion, literature, methodology, and background sections? With a “duh” as in “Why haven’t I thought of that before”? Generally, clients appreciate how a flipped report values their time. On occasion, you and I will find audiences who really bristle at the idea, usually people steeped in the academic culture, so check first if a flipped report structure would be okay. Culture change is slow, so the first tip is to be patient. After that, try remaking one of your own old (bad) slides or graphs to show what an overall would look like. See if you can get a friendly client or customer you know to give you feedback on it. Then report on the redesign and the feedback to others in your organization. Try getting someone from senior management on board. Leave a copy of my book in their mailbox or in the break room. And hang in there. How do we report small numbers? Without percentages? I would report small numbers as raw numbers, not percentages. Try an icon array for a visual. Where is the best place to get report templates? In your imagination! Any report template is going to look like a report template, not like something that fits your own work. Look around for inspiration, for sure, like on my Pinterest boards, but create your own style that fits you and your work. What program do you use to create dashboards or infographics? We’ve used Piktocharts…. are there others? I work within the Microsoft Office suite. I make dashboards in Excel and infographics in PowerPoint. This way I have total control over the design and everyone on my team can make edits. A quick Google search of either dashboard or infographic programs will give you hundreds of choices you could work with. If you want something from that list, look for maximum flexibility, low learning curve, and reasonable expense. Each chart can have multiple findings; are we skewing the results when we highlight certain findings over others using color and data? “Skewing” sounds like we are manipulating, but that’s not the case. Using color to highlight a certain part of the graph still leaves the rest of the graph completely intact and able to be seen. Adding color does, however, reflect an interpretation we have made of the data. But that isn’t “skewing” – it’s telling people our point and that’s why they are listening to us in the first place. Can you please explain the difference between your two books? Thanks! Sure! Effective Data Visualization walks you through how to choose the right chart type and then how to make it in Excel. Presenting Data Effectively talks about formatting graphs well with consideration of text and color and broadens that discussion to address dashboards, slides, handouts, and reports. One challenge I face is presenting nuanced findings in an accessible way. For example, when there are limitations to the data or subgroups that need to be acknowledged or findings need to be interpreted with caution. As a researcher, it worries me that the client might put tentative findings “out there”, misrepresenting them (to a degree). This makes your title and subtitle ever more important. Be very clear in your wording that the findings are limited. You can also add things like confidence intervals to your graph if you are confident that the reader will know how to interpret them. If it is still going to be a concern, don’t make a graph of the data. People are drawn to graphs because we look at pictures so don’t put the data in a picture if you are worried people won’t read the nuanced narrative. How Do Futurists View Time? As a descendant of World Future Society Bulletin, the journal, World Futures Review, aims to be the source for information about futures studies as an academic and applied discipline. The editorial team of WFR is interested in anything that identifies and problematizes the intellectual roots of futures studies, not only in terms of other futurists, but more generally: what scholars, schools of thought, ideologies, cosmologies, ontologies, ethical concerns, social theories, methods, underlay what the early futurists thought and wrote? What now? What should underlie them? To determine how futurists today view time, and use the concept in their work, I sent out a call for papers on that subject. This issue of WFR is the first of what may be two or more issues of WFR devoted to a consideration of time and futures studies. To submit a manuscript to WFR, please visit the manuscript submission portal. You can find the full Submission Guidelines here. The positive impact of firm-sponsored training on workers’ wages and productivity is well documented. At the same time, many studies are highlighting innovation as an important component of firms’ performance. This paper links these two ideas and investigates whether firms who invest more in training their workers reap reward through better innovation performance. Bauernschuster, Falck, and Heblich (2009) argue that continuous training guarantees access to leading-edge knowledge and thus increase a firm’s propensity to innovate. In fact, lack of skill within the enterprise is one of the two most frequently reported obstacles to innovation amongst Canadian firms (Statistics Canada (2012)). Our results show that more training leads to more product and process innovation, with on-the-job training playing a role that is as important as classroom training. These results are important because many policies used by governments throughout the world to encourage firms to invest more in training put more weight toward more formal or structured forms of training like classroom training. Stay up-to-date with the latest research and sign up for email alerts today. Most organ izations must be able to combine efficiency, innovativeness, and safe and healthy working conditions, but these demands may appear paradoxical to the employees, and if not handled well by the organization, such paradoxes may create stressful goal conflicts. A large amount of research, not least organizational climate research, has focused on how organizations may promote each one of these goals, but we believe there is a need for research that may help organizations to effectively and simultaneously attain different goals. This was the starting point for this study where we investigated how organizations may support the employees’ ability to reconcile conflicting goals, and thereby promote organizational success as well as employee well-being and sense of worth. Organizational demands on productivity, innovations, and safety may seem paradoxical. How can the organization support employees to cope with such paradox? Based on organizational climate measures of safety, occupational health, innovativeness, and production effectiveness, we explored if a second-order organizational climate could be identified, that was associated with staff safety, health, innovations and team effectiveness, and if such a climate could be represented by an organizational climate of perceived organizational support (POS). Questionnaire data were collected from 137 workgroups in four Swedish companies in construction and mining. Analyses (structural equation modeling) were done at the workgroup level and a split sample technique used to investigate relations between climates and outcomes. A general second-order organizational climate was identified. Also, an organizational climate constructed by items selected to represent POS, was associated with team effectiveness, innovations, and safety. A POS-climate may facilitate employees’ coping with paradoxes, and provide a heuristic for managers in decision making. Sign up for email alerts so you never miss new research. In the latest podcast from Journal of Management Education, Jane Murray speaks with Jerome Katz and Sarah Wright about their article, “Protecting Student Intellectual Property in the Entrepreneurial Classroom.” The podcast delves into the inspiration for Sarah to interview Jerome about student entrepreneurship, as well as what future research and projects this paper has sparked for Sarah and Jerome. While universities are intensely protective of revenue streams related to intellectual property interests for the institution and professors, the financial and legal interests of students in the entrepreneurial process have largely been overlooked. This lack of attention, both in universities and in the literature, is intriguing given the mushrooming growth in entrepreneurial education courses in almost every U.S.
university. This article builds and reflects on an original article by Katz, Harshman, and Lund Dean where the authors advocate for establishing classroom norms for promoting and protecting student intellectual property. We present research, insights, and reflections from Professor Katz regarding the controversial ethical and legal issues related to student intellectual property in university settings and provide suggested resources for faculty traversing these issues. Interested in hearing the interview? You can listen to the full podcast by clicking here. You can also read the article, “Protecting Student Intellectual Property in the Entrepreneurial Classroom” from Journal of Management Education free for the next two weeks by clicking here. Want to hear more podcasts from Journal of Management Education? Click here to view the journal’s podcast archive! You can also stay current on all of the latest research published by Journal of Management Education by clicking here to sign up for e-alerts! Interdisciplinary research is seen as very valuable for society and economy. Some of that could be hype, but there are some good examples of what it can do. You have probably noticed that oil is no longer 100 dollar per barrel, and the US is no longer a big importer. This is a result of fracking, a result of interdisciplinary research. And if you don’t like fracking, a good alternative is photovoltaic energy, which comes from the sun, and from interdisciplinary research. So some interdisciplinary research has been good for society. Is it also good for the scientists who are supposed to do it? The answer to this question is very interesting, and is reported in an article in Administrative Science Quarterly by Erin Leahey, Christine Beckman, and Taryn Stanko. The start is easy to explain: interdisciplinary research is less productive, but it gets more attention. The answer got more complicated, and more interesting, when they started looking at why that happened. The first step was to look at whether interdisciplinary research is more difficult to do, or whether it is because it is harder for it to gain acceptance and get published. The answer is clear: it is not harder to gain acceptance, but it is harder to do, especially early on. The second step was to look at why this research got more attention. Here many factors played a role, but one stood out to me: Actually what increases especially much is the variation in how much attention interdisciplinary research gets, and that helps explain the increased average. So interdisciplinary research is related to fracking in one more way – few reap the awards from it. This paper doesn’t really result in career advice for scientists, because everyone will be interested in different kinds of research, and have different ideas on how much risk to take on. But has important insights on how innovations are made. Building on closely related ideas is much easier to do, so no wonder much of what scientists – and companies – do is incremental. And this is true even though we often tell stories of the great successes of interdisciplinary research and integrative innovations, while forgetting all those who tried and didn’t succeed. Whether that means we cross-fertilize knowledge too little, too much, or just enough is hard to tell. You can read the article, “Prominent but Less Productive: The Impact of Interdisciplinarity on Scientists’ Research” from Administrative Science Quarterly free for the next two weeks by clicking here. Want to stay up to date on all of the latest research from Administrative Science Quarterly? Click here to sign up for e-alerts! Does Family Management Inhibit the Technological Innovation of Family Firms? The enormous impact of innovation on economic growth and job creation worldwide and their particular importance for family SMEs. Family management reduces the efficiency in converting R&D into technological innovation outcome. However, family management more effectively leverages technological innovation, thereby increasing long-term performance. Given the importance of R&D to firm performance, family managers should understand the potential pitfalls that attempting to protect their socio-emotional wealth can have on technological innovation outcomes. Simultaneously, family businesses should consider the competitive advantages associated to family managers, who are more efficient in exploiting their given technological innovation outputs, which in turn increases long term performance. Although this study considers family-managed firms as a particular group, future research should take into account that there is heterogeneity among them and should evaluate the differences among family-managed firms with regard to long-term innovation strategies. The aim of this research is to study the moderating role of family management in the relationships between the intensity of research and development and the occurrence of continuous technological innovation and between the existence of technological innovation outcomes and long-term firm performance. The results show that family management reduces efficiency in the conversion of research and development expenses into technological innovation outcomes over time. Our findings also suggest that the influence of family management significantly contributes to improving the effect of the achievement of technological innovation on long-term performance. You can read “Technological Innovation Inputs, Outputs and Performance: the Moderating Role of Family Involvement in Management” from Family Business Review free for the next two weeks by clicking here. There’s also still time for you to read Family Business Review‘s inaugural review issue, which closes at the end of August–click here to read it! Want to keep current on all of the latest research published by Family Business Review? Click here to sign up for e-alerts!